Welcome to Roberto's Italian Restaurant!! Roberto's opened for business in Florissant in September of 1962. Our parents, Robert and Margaret Camenzind (better known as Bob and Peggy) opened the restaurant very near its current location with just a couple of booths and tables. They worked full time jobs during the day and ran the restaurant at night, often staying open until the early morning hours to accomodate the many shift workers who lived in the area. Bob and Peggy realized they needed more room for their customers so they soon moved just a few doors down to our current location and made this their livelihood. The restaurant had 17 tables and a strong carryout business for many years. Bob and Peggy operated the business for nearly 38 years with their daughters Janice, Laurie, and Karen helping them. Bob was the "Master Chef" and Peggy managed the service end until May of 2000 when they retired and the second generation began ownership of the business. 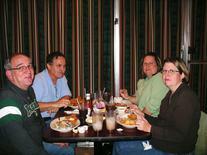 In 2006, to answer a growing demand for more seating availability, we expanded the restaurant and remodeled. This was done to meet the goal of keeping the family tradition the restaurant was built on while appealing to customers of today. We are now able to have larger groups without affecting our regular family customers or our thriving carryout business. Roberto's has always been known as a quaint family restaurant with reasonable prices and a delicious menu that offers something for everyone's tastes. We still use the same recipes the restaurant was built on by our parents but we have added some new items to enhance our menu and meet all of our customers' wishes. We take pride in our restaurant and we will continue to provide the best food possible. 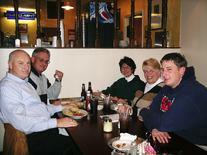 We have seen generations of families come to the restaurant over the years and we have made many great friends. We look forward to serving you and your family for many more years.